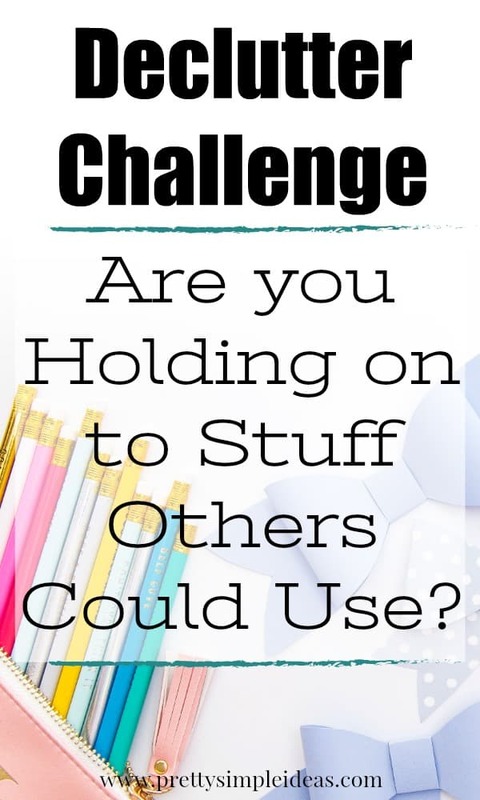 Are You Holding Onto Stuff Others Could Use? I am so excited to kick off my Live More with Less series with a post on de-cluttering and generosity. 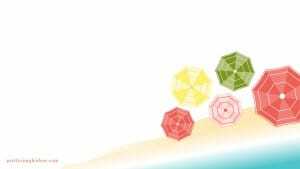 Yes, I realize the the title reads, “Are you holding onto stuff others could use?” but while it might seem like a post on minimalism (which it is) it is also very much a post on giving to others out of our abundance. 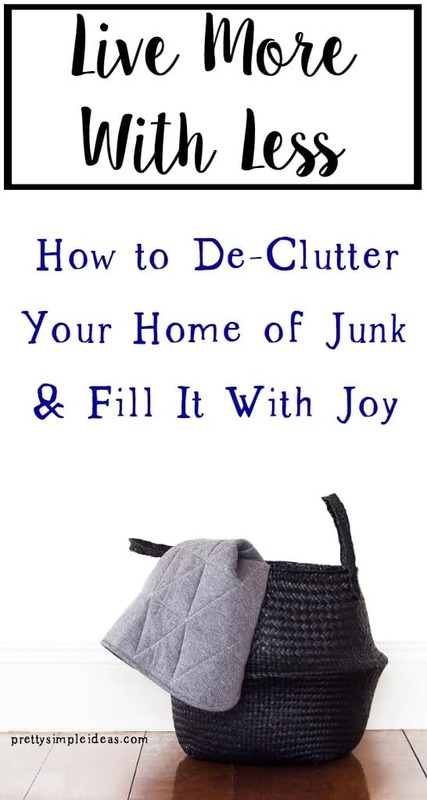 Because wouldn’t it be wonderful to have a home clear of junk, but also filled with joy? *This post contains affiliate links which means if you purchase an item through one of my links I may make a small commission but it won’t increase the price for you. But first, let’s talk about our stuff. Do you feel like it controls your life? Do you trip over it in the hallways? Are you sick of shoving stuff in a closet and leaning against it so you can get it closed? Can you never find anything when you need it? Does the clutter in your home make you anxious instead of bring you joy? Maybe you can relate. Or maybe you’re on the other end of the spectrum. You can’t get enough stuff! You need to buy the latest watch or pair of shoes and nothing ever seems to satisfy you need for “new” or “the best.” Even minimalists can fall into this trap. Sure, they can have very little, but if it always has to be the top of the line it is defeating the purpose of living simply. I have fallen into these traps. I’ve held on to stuff I didn’t need, even when I saw people who could use it more than I could. I’ve also donated bags of stuff to the Salvation Army only to fill up my Amazon cart the next day. But this is not the way I want to live and maybe you can relate, too. Guys, we live in abundance here. Yes, all of us. The story of the widow in Mark 12:41-44 often reminds me just how much more we have to give. Although she only had two coins to her name, she put them both in the offering plate. She truly gave everything she had. When I think I can’t spare any more or time, I want to go back and re-read this story to remind myself that as long as I have something – anything – I can give to others. And in reality, I have a lot that I can give. This morning, I pulled out a towel from the closet for my shower among the many towels I own. Then, I had the choice to make eggs, cereal or a smoothie. I had to push around a few pairs of shoes to find the ones I wanted to wear and I chose whether to wear my watch or my Fitbit. We live in abundance. And yet it is often not enough. That’s because blessings can become burdens when held for ourselves. But blessings can also multiple when shared with others. Would you like to enjoy the simple things in life? To fill your cup with family time, faith, friends and fun? Would you like to appreciate the things money can’t buy? And to be able to give to others in need? Then let’s do this. Here are my steps to live more with less. STEP 1.) Make a commitment to live more with less. It’s not enough to say, “Sure, it would be nice to de-clutter my house and be able to give more to others.” Make your words your actions. Decide this is the year (and month) to get back to the basics and clear out what you don’t need. Write down your commitment. Tell a friend. Share on Facebook. Whatever keeps you committed to this plan and sets you on the right path. Consider this post my commitment to myself and you all. For further encouragement check out my friend Erin’s post on 10 Ways Minimalism Ruined My Life. SPOILER ALERT: They were good things. Yes, this is a huge step, but I am not going to take forever on it. There are countless posts on minimalism and de-cluttering out there that you can dive into. What I can suggest is that you go through your home or apartment systemically to sort out all your stuff. What I mean by this is don’t do all the socks from one room, crafts from another. 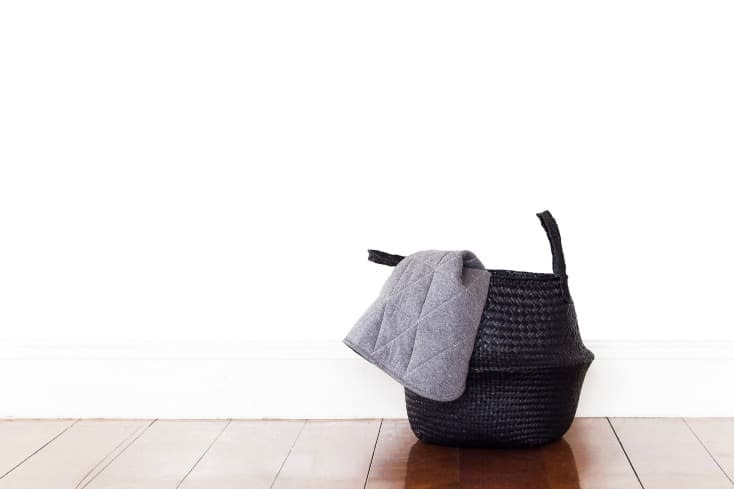 Tackle a full room at a time and as you go decide where all certain items will be kept from now on. This post on Four Steps to Declutter your Home or Office will really be able to help you cut down on the clutter, as well as this post on 10 Tips to Become a Better Organizer. I can also offer some “quick tips.” Every item you pick up (and you must physically pick up every item) decide which of the following four actions you will take with it. Everything else you are going to want to sell or donate. But again, it is critical that you go through your home and make a decision about every single item. If you feel overwhelmed don’t be afraid to start small. Pick one room this month and decide to tackle it. While it is not important how quickly you do it, it is important that you do a whole room at once. Why? Because if you go bit-by-bit throughout the year you will fill up your rooms again. EXTRA TIP: Take everything out of every drawer and cupboard and sort through in a DIFFERENT room. It is not possible to fully de-clutter by going item-by-item. Everything needs to come out of the space it is in and touched separately. 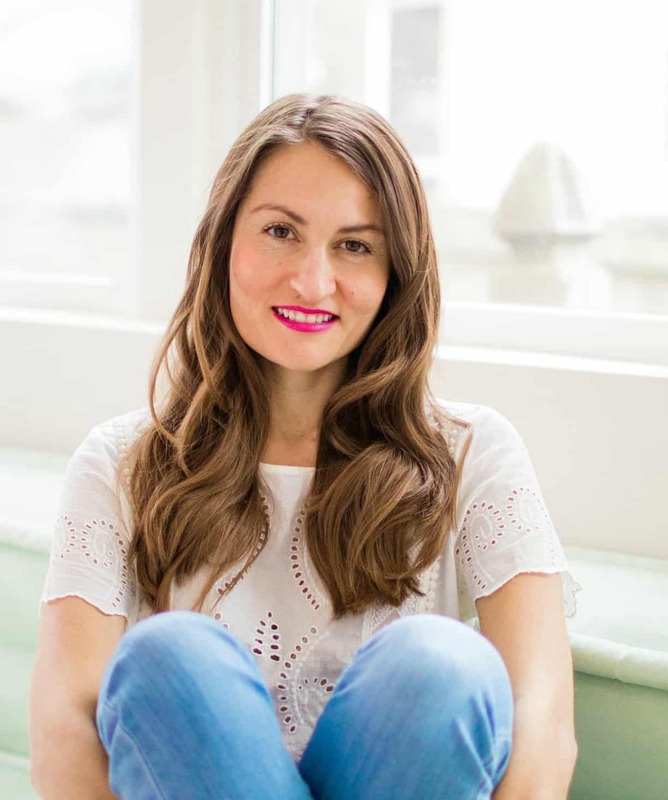 For even more tips I’d also recommend reading The Life Changing Magic of Tidying Up. Now that you have sorted and organized your items into “Keep” “Sell” and “Donate/Giveaway” piles it is time to take action. Ready? STEP 4.) Decide what to give away to family and close friends. Think of a time someone gave you something unexpected but you were so grateful. Since I’m pregnant right now my sister recently gave me boxes and boxes of new or almost new baby clothes for our little girl coming soon. And between my sister-in-law and my husband’s cousin, I was given a whole new wardrobe of maternity clothes. Their generosity not only saved me a lot of money, but was really thoughtful, too. It filled a need I had and I hope to do the same with items I no longer need or don’t use, too. Now, it’s your time. As you go through your house de-cluttering, keep in the back of your mind someone who might be able to use or would love an item. These can be people you know with real needs, or just an item you know someone would enjoy. You will get more out of giving away these items than even those people receiving them. I recently did this with several items after my husband and I moved. We move every year here in D.C. to avoid rent increases and it’s actually been a blessing in disguise as far as getting rid of stuff we don’t need and give to my sisters, nieces or friends. I see stuff in my home all the time that I realize I don’t need and automatically think of someone I know would love it. I then put it in a closet to give to them the next time I see them. If you need some “generosity” inspiration I’d recommend reading “Silver Boxes: The Gift of Encouragement“ by Florence Littauer. Great read! After you give away those items you will feel a sense of accomplishment. Not only did you clear a room in your home, but you were able to give something special to someone else. This should encourage you to take the next step: decide what you can sell. I am going to write a post soon on how to get the most money by selling your stuff online. For instance, I once found a pair of bar stools in our apartment trash room that I sold for $200. I can’t wait to share some secrets. But until then try your hand at selling on Craigslist or Facebook marketplace. It’s quick, there is no cost to you, and you can start to de-clutter even sooner. Also, if you have clothes to sell try Poshmark or Threadup. After you’ve sold or try to sell items that can make you money, bag up the rest of your stuff head to your local thrift shop. And if you have new or gently used furniture, housewares, or building material I’d recommend donating to your local Habitat for Humanity ReStore. The money from these items sold go towards helping families in need build an affordable and livable home. Many Habitat ReStores even offer free pickup for large items. Nice. As I mentioned earlier, sometimes I’ll rid my house of so much stuff only to go on a shopping spree after. Don’t do this. It not only defeats the purpose, but could be costly and fill your home with stuff you don’t want. Unless you have an absolute NEED for something try to wait a month before making any new purchases. I’ll willing to bet that sweater you had to have is not as important anymore. The more you practice this technique the more you realize you don’t need the newest/latest/great items and are even enjoying living more with less. It’s not just material goods we hold on to. Sometimes it’s our talents, or even just time. Giving stuff away has always come easy to me but if we’re being real here, I “hold on” to my time. I’m an introvert and time is precious to me. While it’s okay to guard it to some extent, I am often selfish with it, too. If you can relate perhaps you will enjoy this article on 8 ways to Happily Host as an Introvert. Guys, there are so many minimalism and de-clutter posts out there. While I do think it can change your life it is also just as important to “fill” your home with something to replace the items you got rid of. Let’s take out the junk and fill our homes with joy through generosity. Let’s live more with less. If you enjoyed this article you might also enjoy my newsletter. Get on the list HERE. I think that giving items that you know someone could really use or would really enjoy rather than keeping it to clutter up your home is such a good idea! When we moved overseas, we needed to get rid of most of our things–we ended up giving a bunch of household things, including all of our Christmas decorations, to my newlywed BIL and SIL who were just setting up a first home. Different things like blankets and clothes and kitchen tools went to different family members–now, on visits back to the USA, it’s so fun to see my favorite mixing bowl set being used in my aunt’s home, or framed photos that we had in our house hanging on the walls of other relatives’ homes! We couldn’t hold on to those “things” any longer, but I’m still glad that other people I love get to enjoy them! I love this story. And it’s even better when you see someone using the stuff you gave them. Having too much stuff cluttering our lives is stressful! You’ve provided some great tips. We have a nonprofit in our town that provides furniture to people transitioning out of homelessness into apartments. I’ve donated furniture to them, and have been thrilled to see how they’re able to repurpose that old furniture into fresh new goods for those folks. Andy, what an awesome nonprofit! I wish every town/city had that. As a result of The Depression my father held onto to everything because he vividly remembered how it was to live “without”. I had the same mentality until he passed in 2015. It was so hard parting with his belongings knowing that he would not throw something away if it wasn’t completely useless. I have now overcome. He is a navy veteran, so I donated as much as I could to Purple Heart. I have also sold vintage items on eBay. Now I am on a mission to go through my house the same way. Donating everything that I cannot sell, and only keeping items that we truly use. Love your post! Sheree, this story is beautiful! There can definitely be an emotional connection to our possessions so I can understand that struggle I love how you donated your father’s items to Purple Heart to help veterans and that this is your mission in your home to give to others, too! I can honestly say I read every word in this post and you are probably the only person on planet earth that I think just might need more stuff…..not less. Hehe. I have a baby scale too, really nice thing to have so you can fret about the babies weight. Just kidding! It lets you know if you’re on track and is a super accurate one, it’s ounce for ounce as good as my pediatricians. Sadly, Timmy just got fed up with being put on it!! But temporarily stop spending? Tom has banned me from the Gymboree site!! He says I can go on anymore! Just because my clothes are 5 leggings from Walmart and my kids look amazing……. I’ll take that as a compliment that you read ever word. I am keeping all baby clothes from a certain sister though..
I’m loving this post! I want to be more minimal myself; so I’m starting with my closet. I have clothes I haven’t worn for years and some have tags. I will probably just donate them, there is no need for me to try to get money from them when some don’t have money but need items. That is very generous of you, Leslie! Good luck with your de-cluttering process. I absolutely love to purge our home! It’s probably unhealthy how much I love it! 🙂 I adore how you said we hold on to our “time”. I can attest to this, being an introvert too. Thank you for reminding me to give my time away to my family and close friends! <3 Thank you for sharing! These are all great tips! Living with less has truly changed my life for the better! It’s something that can seem so overwhelming but really is life transforming! Thank you for all of this awesome insight! I just went through all the clothing in our home and donated to a women and children’s homeless shelter. I will be tackling the kids’ toys next and then on to the rest of the “stuff” we don’t use. You offer some wonderful tips and ideas for going forward. I love that you found a women and children’s specific shelter! Such a good reminder. Your post really hit home for me when you talked about the choice you have – your choice on what to have for breakfast, which pair of shoes to wear. I too have so much abundance. I am truly aware of this, yet I know I am guilty of buying things I don’t always need – perhaps due to a great sale… but then I feel guilty for my purchase. I’ve travelled the world a lot and seen just what people don’t have. Thanks for helping me remember this. I definitely want to take action and give more back and stop purchasing. I wrote this post also as a reminder to myself of my own abundance. It’s true how little some people have around the world. That must have been a real eye-opener. I love this! We are currently in the process of decluttering our home. It’s a long process, but an important one. We have so much stuff that we don’t use that can definitely benefit someone else. So recently we donated several boxes to GoodWill, and we even made a large box filled with clothes and supplies and sent it over to Haiti. That definitely made us feel happier knowing we were helping others who needed that stuff way more than we did! Haiti! So cool. I wouldn’t have even thought to put other countries but I love this. Definitely trying to declutter this year! We have a great local Buy Nothing site on Facebook and I love putting things on there that I can’t use anymore but know that someone else could. oooh I need to find a site like that! This is so helpful! I was just talking with my mom about how holding on to things is robbing another of having what you aren’t even using. What an eloquent way to phrase it, Bailey. I have tackled my closet and gave a number of items to Dress for Success. I need to tackle the rest of the house. I totally agree that doing one whole room at a time is the best way. It gives you such a sense of accomplishment! I will have to check out Dress for Success! I love how you took something practical – like organization – to God in prayer. I am trying to do that with the small things throughout my day, too. This is so true. We have so much stuff we don’t need in this house that I think will be used more by others. It is overwhelming, but one of my resolutions is to go room by room this year and declutter. That is a great resolution, Leigh! I love de-cluttering! It can totally feel like our stuff controls us, and it’s so great to let go- both figuritively and literally! What a perfectly timed post! I’m in the process of throwing out right now! I have tons and tons of stuff! I can’t wait to share your post! All of my friends and I are working on declutter right now- I have so much clothes that I’ve simply grown out of! I found I’m a creature of habit and literally use 3 pots… so I’m donating the rest! your words helped me realize how the extra “stuff” was weighing me down! Bravo for a great post (series) and for motivating others to consider following these strategies. I’m on the same journey, and actually began in earnest back during the first week of November, when we had a powerful windstorm here in Maine that knocked out power for nearly a week! About that only thing I could do during the day was declutter and reorganize, so I began what seemed like a Herculean task. Still working on it, but that week was a good beginning, and gave me the motivation to continue, a little at a time. Wow I guess whatever it takes – even a giant windstorm. Good luck with the rest! Yes, I have tripped over stuff in the hallway. My wife and I currently are working on getting rid of a ton of leftover wedding stuff while working on getting ready for our unborn child (due soon in April!). We’re having our first baby in April too! Congrats! This is a great way to start of the new year! As a beauty blogger I try to declutter makeup as I get more! Taking everything out of one room and moving it to another in order to sort it is a great idea! Especially the kitchen–moving that junk out of the “kitchen context” would make it easier to get of most of it! Exactly! It’s amazing how well that trick works. Good advice. I wish I decluttered more frequently than I do now. One thing I have stopped doing is accumulating more. Hey! That’s a great start. So many times we hang on to things we don’t need or use that could really be making a difference for someone else. Thanks for sharing! I love the idea of getting rid of the clutter around us. I think our things have a way of getting in the way of enjoying what truly matters. If we are always stressing out about all the stuff we need to organize and clean then we don’t have as much time to actually enjoy the stuff we have.